My impression of comics writer Charles Soule is he is solid. He writes good stories, but not really what I would call outstanding ones. Though I have really enjoyed some of his runs, like She-Hulk. But up until a few weeks ago I would have found him an odd mix for something in the Star Wars galaxy. Soule's a superhero guy I would have proclaimed. Then a few weeks ago I introduced myself to his Letter 44 independent title, which is a deep character story based within a science fiction world with a great twist. So maybe his inclusion in the Marvel Star Wars properties was a better match than I imagined. Star Wars Poe Dameron: Black Squadron by Charles Soule with art by Phil Noto appears to take pilot Poe Dameron up to the opening of Star Wars The Force Awakens. General Leia Organa tasks Dameron with keeping vital information away from the First Order, by finding it first. He is assigned finding Lor San Tekka who has information about the location of the General's missing brother Luke Skywalker. To complete his task, Dameron recruits his own squadron made up of pilots that are more family than friends including Snap Wexley. Dameron's search for Lor San Tekka takes his Black Squadron to isolated settlements and intergalactic prisons. To make his task even more difficult, Dameron is challenged along the way by First Order intelligence officer Agent Terex and a mole within the Resistance relaying information about Black Squadron's objectives! I really enjoyed Star Wars Poe Dameron: Black Squadron. I found Soule's story to be solid and often riveting, especially on the prison planet! And Noto's art is solid with me believing that Dameron, Wexley, L'ulo and others were the Resistance fighters we saw on the big screen. In many ways this story is great because it gives Dameron and his team more screen time then they got in the movie. So while readers may feel like they know Wexley from other books, this really gives us an insight to these personalities as we get to watch Dameron for example lead, including pilots much older than him, and scheme in order to achieve his mission. If I was going to make one complaint I would ask this title be renamed Star Wars Poe Dameron and BB-8. I do love how in literary offerings that Dameron always calls out to BB-8 as Beebee-Ate! It really feels like a great extension to the films with Dameron drawing out his name. But again, fan favorite BB-8 is as much of a partner than any member of the squadron. And while he may give too many thumbs up, he is fun, interesting and always engaging on the screen even if his panels are often only filled with beeps and clicks instead of narrative. In many ways that is a tribute to Soule and Noto that wordless pages still feel weighty to the story! 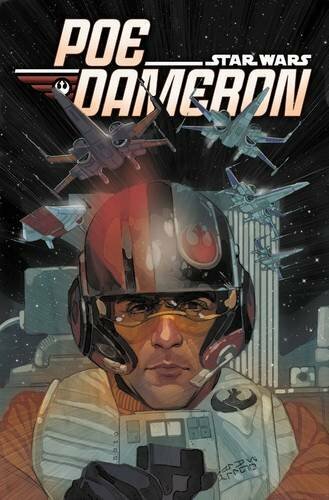 I was nervous about Star Wars Poe Dameron: Black Squadron but now I am thrilled to know that more volumes of Poe Dameron's comic adventures are on their way, I had the impression this was a limited series. I loved getting to see Dameron do more than sit in a cockpit but be a Resistance leader in action. And Marvel gives Dameron the screen time fans hoped he could have. For those who read across the entire Marvel library of titles, there are even connections to other titles that help show you the story at another moment! Honestly, this is another fine contribution to the Marvel Star Wars library. 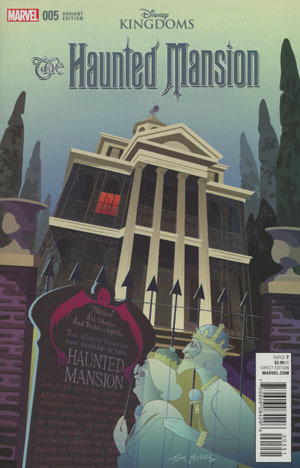 Haunted Mansion #5 concludes Danny’s tale. Danny gets out of the Mansion. 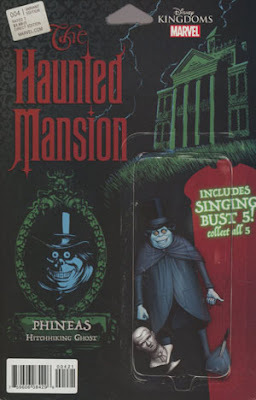 But he jumps right from the Mansion and into the graveyard. But Danny is not the only one who escapes as the Captain is closely following his heels. Danny and his spooky friends have to face off against the Captain in one last boss battle. And we can be glad that Danny is outside as he can now count on those beyond the Mansion to help defend him. Joshua Williamson and Jorge Coelho do wrap up their story. And as a treat Coehlo gets to draw one last classic Mansion scene, the graveyard. The story is ended and gives satisfying conclusions to the story including what happens after the boss battle, where was Grandpa, and what do the survivors do next. Though, I would have liked to see our hero have a slightly more engaged role in the conclusion. 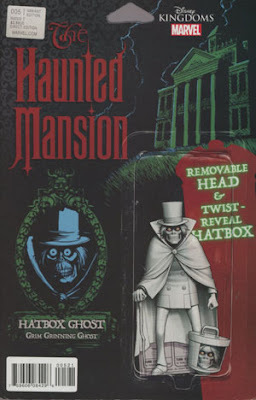 And I would have enjoyed a major return of the Hatbox Ghost. But overall, as an adult Mansion fan I was pretty satisfied though the tale may have lacked the story complexity I would have desired. But for the Between Kid the story was a huge success where the Kid was excited to dive into each issue with me. Interesting! Of the first four issues, the sales for three issues were well over 20,000 copies. And the one that dipped was issue #3 with the next issue rebounding. That is pretty impressive and largely steady sales. 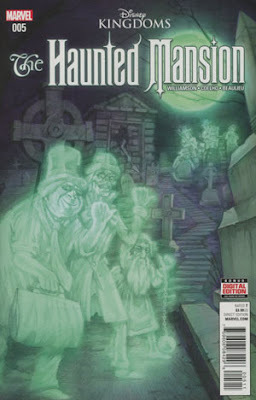 I can believe that based on sales and popularity of the franchise we could see a Haunted Mansion return. And I would be all for it, because the Between Kid loves this story while feeling safe about something that can be scary. And I hope the Kid will be more excited about future tours through the real life attractions. And in the end, that is what really makes me hopeful and happy with these comics! Over that last three years I have criticized, poked, mocked and been frustrated by Star Wars books! But just let me start with this simple piece of advice, go out right now and buy or borrow E.K. Johnston's Star Wars Ahsoka. It is a choice that you will not regret. Star Wars Ahsoka picks up a few years after Star Wars: The Clone Wars. Former Jedi Padawan Ahsoka Tano finds herself in a galaxy where the Jedi are hunted by the Empire. And despite her break from the Jedi Order she is forced to hide her abilities from both friends and foes. Ahsoka after a run in with the Empire flees to the farming moon of Raada. There she hopes to live quietly and alone. But she makes the mistake of becoming friends with some of the farmers in the days before Imperial forces come to the moon to exploit the agrarian population. Ashoka finds herself in a place she did not want to be, fighting to protect others! But sometimes protecting those you care about is going on the run yet again! Because the Empire has added a sinister and unknown weapon to hunt Force wielders. I loved this book. It does a great job of describing Ahsoka's journey from Star Wars: The Clone Wars to Star Wars: Rebels. The story does a good job of weaving her past while also pointing us into the future. In many ways, I do feel like her story and Kanan's are similar with both going into hiding, connecting with others and then finding they must make a stand despite great personal risk to defend the liberty of others. An additional subplot that readers get involved with during this story is how Ahsoka built her new white lightsabers and the significance of the color. And like the main story the payoff is highly satisfying and fits within Ahsoka's character. I found the book very easy to read. In fact, I broke my reading pattern and snapped it out of my travel backpack because I just really needed to see what would happen to Ahsoka next. I personally hope that Johnston writes more Star Wars books, and if she wrote again on Ahsoka I would anxiously await that book! 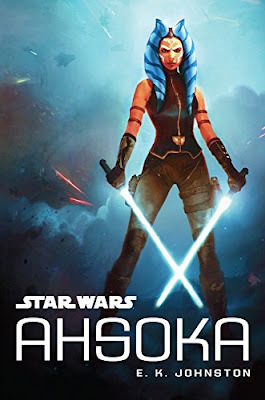 Star Wars Ahsoka is a book many Star Wars fan friends raved about. Now I know why! The book is a great fast-paced adventure with a character that many Star Wars fans love! The volume also helps connect Ahsoka two separate, to date, television appearances. It was a truly enjoyable romp! 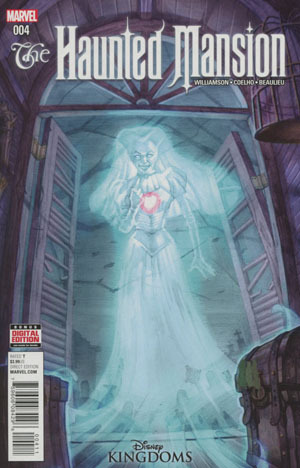 Haunted Mansion #4 focuses on Constance. Joshua Williamson helps us to better understand the famed ghostly bride and perhaps some of her motivation. The Captain wishes for Danny to enter her domain, the attic, to find his treasure. But the attic could also serve as a potential escape from the Mansion’s grip. 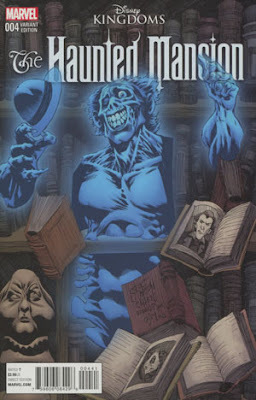 The reader follows Danny as he struggles to be brave, perhaps with some help from his spectral friends. Williamson and Coelho continue their successful wandering through the mansion. And it definitely kept the interest of the Between Kid who instantly wanted to jump to the next chapter. 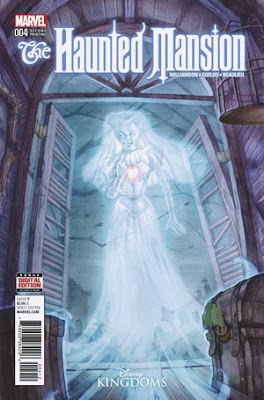 The focus here really is on Constance, who is a serial killer in both her mortal and ghostly life. She is a terror to all who get near her ax, creating fear even with the Captain. And her appearance is a threat to both Danny’s mortal and spiritual existence! We are at the edge of our seats as this issue ends. Can Danny leap into the next issue and provide us a resolution? 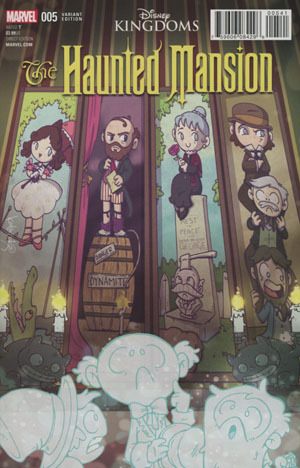 Will Danny and the ghosts be free of the Haunted Mansion…or be trapped forever. Well that’s as long as they miss Constance’s ax!